Consisting af a mosque a public bath a caravansary.a mausolome ‗a tekye (a religiouns and a bazaar).each of which having its own beauty.this complex was founded by the governor‘s wife of yazd in the 16th century. 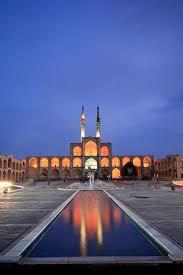 Amir Chakhmagh complex is one of the most remarkable squares of Iran located in the center of Yazd. It contains bazaar, mosque, tekye (A place for mourning), bath and a watering place. Amir Chakhmagh complex was built in the 15th century by Jalal-al-din Amir Chakhmagh, who was the governor of Yazd in the Timurids period. Amir Chakhmagh square was established on the north side of an important mosque called the Old Mosque, known today as Amir Chakhmagh Mosque. At the beginning of 19th century, the square converted to a Hosseiniye(A place for mourning), where Muslims used to gather for Muharram (the holy month). Most of the changes in Amir-Chakhmagh Square were implemented during the modernization period of Reza Shah. By completing Pahlavi Street in 1935, the northern part of the square, which connected it with the Bazaar, was demolished. 13 This square converted also to cemetery in the Pahlavi Period. The complex includes the three-storey tekye which used to commemorate the death of Imam Hussein. In the corner of the tekye, there is a Nakhl (Palm), described as a ―strong, wooden object with very large metal fixtures and studs‖. This palm is a big one named Nakhl-eHeidari (Palm of Heidari). The history of this palm dates back to 450 years ago in Safavid dynasty. It is said to be the oldest palm of Iran. It was venerated during the Shia commemoration festival of Ashura. As for Amir Chakhmagh mosque, installed stone upon the threshold of the mosque face to the square, the incision of endowment deed in Naskh script, fine nets of mosaic tiles of outer circumference of prayer niche‘s dome, and main platform with stalactite worked vault have placed this mosque after Jaame‘ mosque from viewpoint of beauty. This monument has been named now Jaame‘ Mosque, too.